A Regal Fritillary at Fort Indiantown Gap. Photo by DMVA wildlife staff. It certainly has done a pretty good vanishing act. Having once been common from the Canadian maritime provinces south to North Carolina and west to the Great Plains, this species range has contracted dramatically. Now its core range is in the plains, and in the east, it’s sole remaining colony is at Fort Indiantown Gap, PA. That will be our destination on July 10th, and you are invited to join us! The Regal Fritillary apparently needs expansive areas of pristine habitat to survive. It needs large areas of meadow with lots of wildflowers including violets, the foodplant of its caterpillar. This is what Fort Indiantown Gap contains, and is maintained by active firing ranges, prescribed burns, and other military activities, which are being curtailed during the day of our visit. 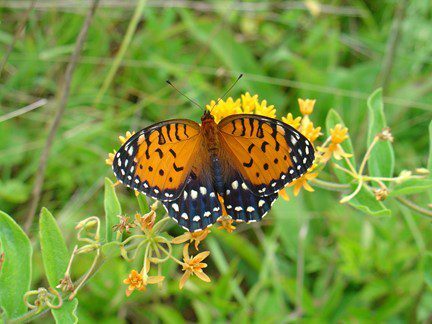 Don’t miss this chance to see one of the most beautiful and rare butterflies east of the Mississippi. 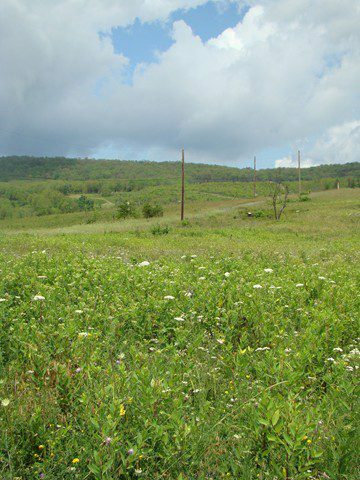 Enjoy hordes of other butterfly species as well, plus grassland birds that are in the area and the blooming meadow-wildflowers. We leave early, meeting at Ashland at 6:30 a.m. and will return by 2:30 p.m. on July 10. Bring your lunch, binoculars, and a camera. 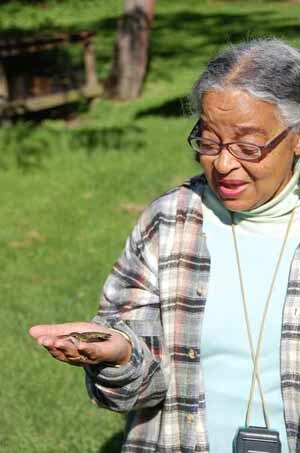 Visit www.delawarenaturesociety.org to register for this program or call (302) 239-2334 ext. 134. As we enter the first week of summer, I think back to my favorite memories of the spring. Undoubtedly, the May 19-21, Delaware Nature Society Laurel Highlands trip rises to the top. This annual Delaware Nature Society offering blends the natural beauty of birds and wildflowers with unique tours of Frank Lloyd Wright’s “Kentuck Knob” and “Fallingwater” houses. The journey through Pennsylvania is very scenic, passing through the pastoral beauty of the Lancaster Amish farm country and the ridge and valleys of central Pennsyvlania. Our first stop was Kentuck Knob. 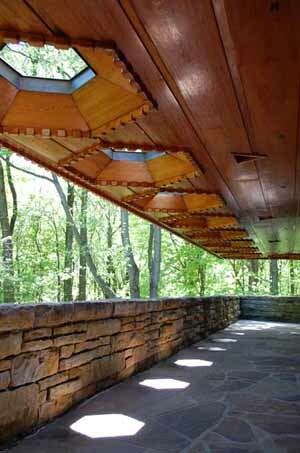 This Frank Lloyd Wright house isn’t as well known as others, but still possesses the features unique to his style: day-lighting, natural flow of air, and vistas drawing the visitor’s gaze to the outdoors without obstruction. Local stone and wood were used in the construction and the house is situated in a manner that blends in with the natural beauty of the site. We had a dinner at the Summit Inn, which sits on Laurel Ridge and overlooks southwestern PA. Soon after, we retired to the Lodge at Chalk Hill which has a pond on-site. We were serenaded by the resident birds and frogs before dusk. The following morning we headed to the Powdermill Nature Reserve. This Carnegie Museum of Natural History research station features a nature center, bioacoustics lab, and the longest running bird-banding lab in the nation. Bird bander Andrew Vitz and his crew treated us to a excellent demonstration of mist-netting, banding, and measuring songbirds. It was quite a treat to view treetop-dwelling and shrub-skulking warblers in the hand, as well as Swainson’s Thrushes and a variety of other birds. A highlight for a few of our crew was when they had the opportunity to release Ruby-throated Hummingbirds right from their hand! Our next stop was Linn Run State and the unique Spruce Bog at the summit. The diverse topography of the highlands creates a variety of microclimates where rare plants and colorful warblers thrive. We enjoyed a picnic lunch with a Swainson’s Thrush taking over the role of the neighborhood robin. A variety of stunning birds were present as we took the short hike to the bog, including Chestnut-sided, Magnolia, Black-and-White, Black-throated Blue, and Blackburnian Warblers. 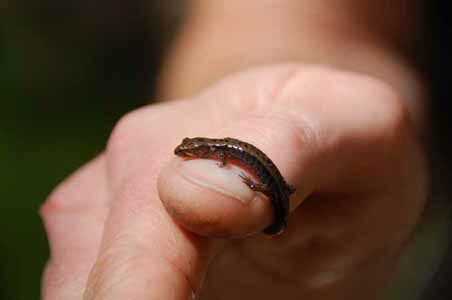 We also found a Mountain Dusky Salamander beneath a log in a spring seep. The bog itself featured insectivorous sundews and pitcher plants as well as wild cranberries. We took another trail to focus on wildflowers. 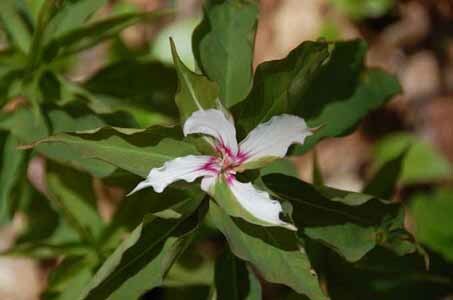 We found painted trillum, including a mutated specimen with 4 petals! Also present were yellow clintonia, bellworts, fringed polygala, and dwarf ginseng. We spent the rest of the day at Ohiopyle State Park. 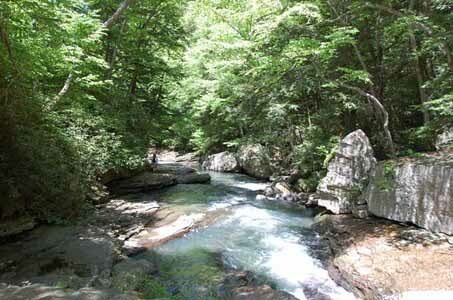 This beautiful, rocky river features a scenic waterfalls and hiking trails. We visited the natural waterslide at Meadow Run, but nobody was willing to test the cool water. Anyone for a slip and slide? Once again we retired to the Lodge at Chalk Hill, a pleasant dinner, and scenic views off of our porches. 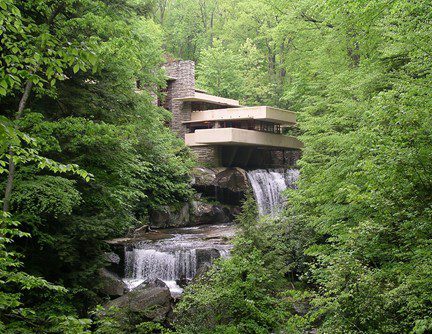 Frank Lloyd’s famous Fallingwater was our last stop on the trip. I had seen the pictures, but have to say that the actual house and site far exceeded my expectations. Nestled next to the waterfall amongst a pristine mature forest with thick rhododendrons lining the stream, bird song was everywhere. Hooded Warblers, Eastern Wood-Pewee, Scarlet Tanagers, and Baltimore Orioles were among the highlights. The entire house, inside and out, exudes a sense of peace and harmony with nature. 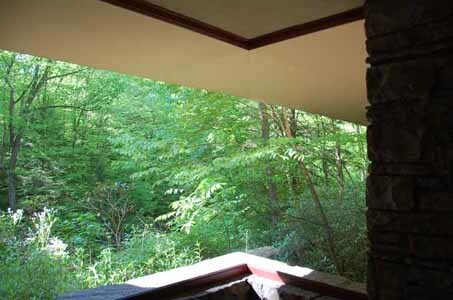 The classic view of Fallingwater. As all good trips must come to an end, we packed our bags and returned to Delaware, already looking forward to next year’s visit. Join us in the future for this wonderful spring trip. 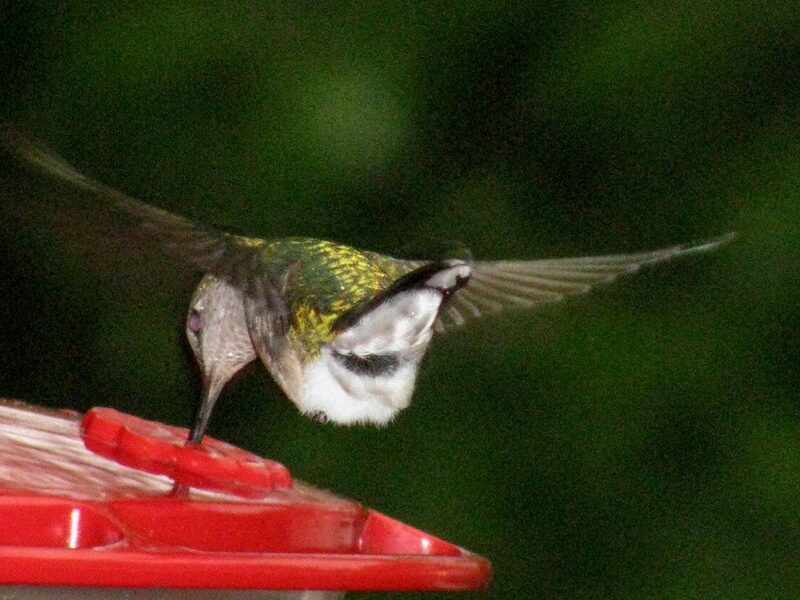 An adult female Ruby-throated Hummingbird visits a feeder at Ashland Nature Center. Photo by Derek Stoner. VRRMMMMM! VRRMMMMMM! What’s that humming sound? The namesake sound of Ruby-throated Hummingbirds is beginning to be more noticeable in backyards as families of these feathered dynamos start foraging actively at flowers and feeders. Juvenile hummingbirds are fledging(leaving the nest) and heading out into the brave new world. With their wings(beating 60 times per second), long beak(with extendable tongue), and rapid heartbeat(up to 1,200 bpm! ), being a hummingbird is like being born a super-hero! They can even fly backwards! A Ruby-throated Hummingbird hovers while dipping its beak into the sugar water feeder. Photo by Derek Stoner. 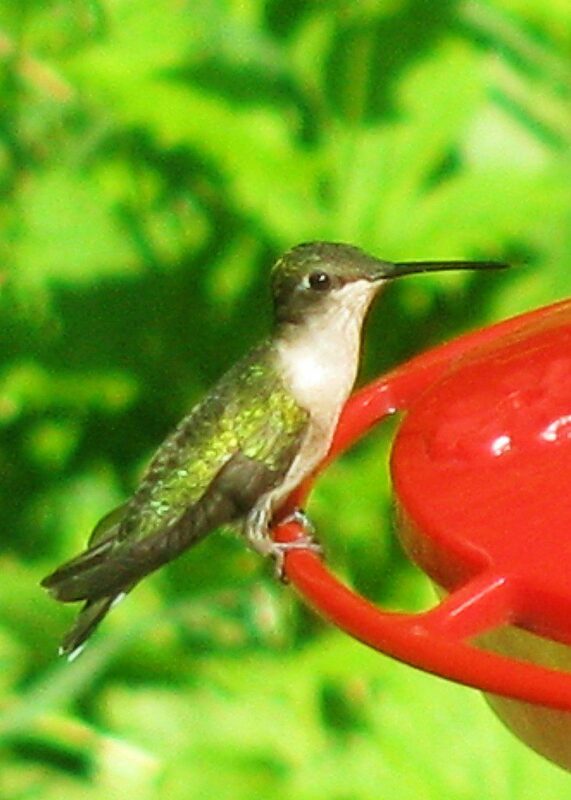 Right now while writing this post, there are three hummingbirds outside my window at Ashland. Two juveniles are at the feeder, and an adult male is perched in a cherry tree nearby. You are invited to join us for our special hummingbird programs this season at Ashland. Enjoy these feathered jewels of summer! Upcoming Family programs through the Delaware Nature Society: Hummingbird Feeders and Flowers – June 26; Hummingbird Banding and Biology – August 21. See www.delawarenaturesociety.org for more details. Yes, it is true. We saw the sun for a good portion of the day yesterday, and we even had a sunset. I was fortunate, because it was the evening of our Flint Woods to Granogue Hike and Dinner, one of my favorite programs. This exclusive hike, on land not accessible to the public, is about 3 miles long. It began in the old-growth forests of the Delaware Nature Society’s Flint Woods Preserve. Here, we saw Pileated Woodpeckers, and heard the beautiful songs of the Wood Thrush and Veery as we passed large oaks, hickories, beeches, and the ghosts of dead American chestnut trees. Eventually, we emerged from the woods and entered the open country of Granogue, which is in my opinion the most impressive of the northern Delaware duPont estates. We were just in time for a sunset and a superb dinner at the water tower. 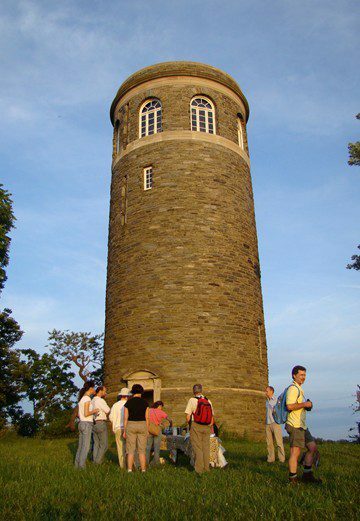 The big water tower in the center of the Granogue Estate is the ending point of our hike and where we enjoyed a wonderful dinner prepared by Michele Wales, Coverdale Farm Program Coordinator. After a 3-mile hike, it was very nice to end with a gourmet dinner prepared and delivered by Michele Wales, Coverdale Farm Program Coordinator. We happily plated our meal, and went to the top of the tower. Here, we ate and viewed the Brandywine Valley, with its undulating hills of forest. 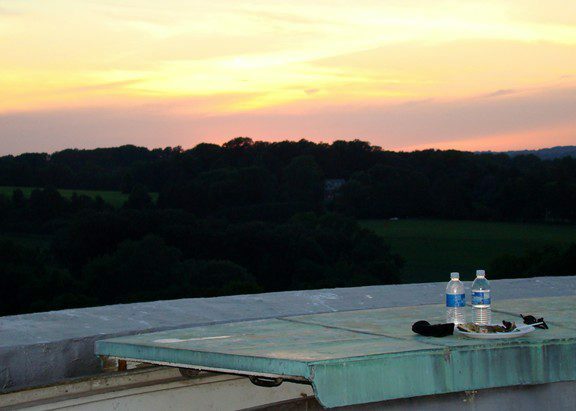 In the distance, we could see hills around Downingtown, PA.
Sunset from the Granogue water tower.